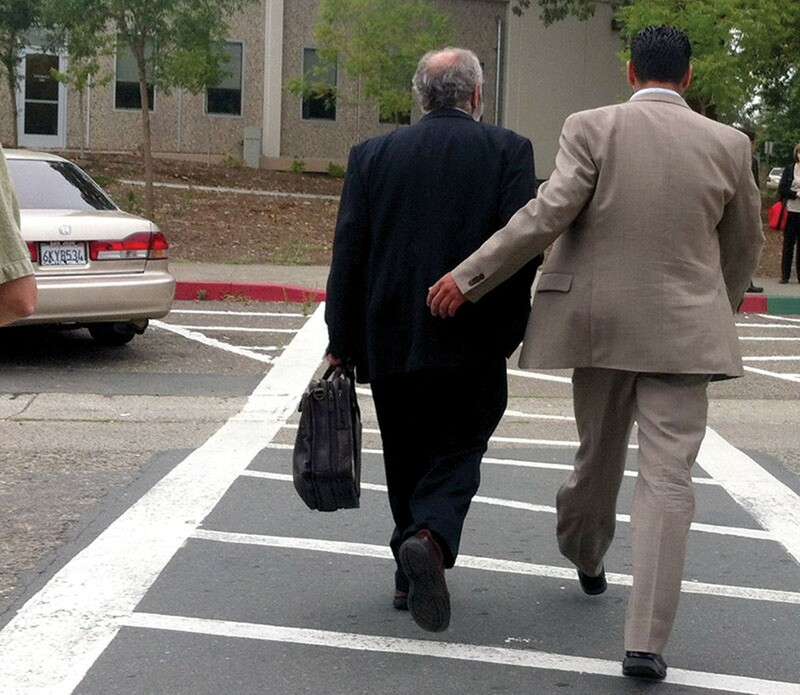 GOT YOUR BACK Efren Carrillo, right, walks away from a court appearance relating to peeking case last year. He denies trying to influence media coverage of his legal woes. An owner of the Press Democrat appears to have influenced coverage of at least one major story in Santa Rosa's daily paper of record. A series of text messages between Doug Bosco and Efren Carrillo from October and November of 2013 indicate that Bosco, a former U.S. Congressman and co-owner of the Press Democrat—and a supporter of embattled 5th District Sonoma County Supervisor Carrillo—has pushed for coverage of a flashpoint issue in Santa Rosa: the death of Andy Lopez, who was shot and killed by a Sonoma County Sheriff's deputy while carrying a toy AK-47 last October. The messages obtained by the Bohemian reveal a spirit of friendship that exists between the men. But they also raise questions about whether Bosco has tried to sway coverage at the PD as it relates Carrillo's arrest on July 13, 2013. A top editor at the paper flatly rejects any suggestion that Bosco has attempted to exert influence over coverage of the arrest. On Oct. 24, 2013, Bosco texted Carrillo, "Do you know the Lopez family? I would like to help them in any way I can, including financial. What a terrible tragedy all the way around." Carrillo responded a few minutes later: "I was just at the vigil tonight, hundreds of supporters, dozens of TV stations, etc. I was left alone as I blended in the crowd. . . . I'm meeting the family tomorrow morning at their request, thanks for your offer. They are likely to seek legal help. . . . I'll let you know—thanks for your compassion." Bosco responded shortly thereafter, "Okay, they are likely to need some financial help with this." On Oct. 30, Bosco sent another text to Carrillo: "Hi Efren. I feel sick every time I see Andy Lopez' parents next to that coffin. Should we start a fund at First Community Bank that people can contribute to in support of the family? I can get plenty of publicity through the PD for it and of course will contribute myself." A news story appeared in the Nov. 7, 2013, Press Democrat that announced a memorial fund had been set up to cover Lopez's burial costs. That night, Carrillo texted Bosco, "Thank you for ensuring the PD covered the memorial set up for Andy Lopez!" The issue at hand is not whether a fund for the grieving family of Andy Lopez should have been set up (although one can imagine the ensuing outrage in Santa Rosa's large Latino community, had Bosco's sympathies instead rested with the officer in the shooting and the newspaper had written a news story announcing the establishment of a legal defense fund for him). Regardless of the well-intentioned and empathic push to set up a fund to cover funeral costs in a tragic incident, the question remains whether or not Bosco is using his power as co-owner of the Press Democrat to influence coverage of issues of concern to him. Efren Carrillo was arrested in the early morning hours of July 13, 2013, after a woman twice called 911 about an intruder on her property. Carrillo was arrested while wearing nothing but underwear and a pair of socks, and was reportedly intoxicated at the time of the arrest. He immediately entered a rehab program after getting out of the county lockup and has returned to his job as county supervisor, despite calls for his resignation. The Press Democrat has reported on the original incident and each of the five court delays in his trial for a misdemeanor peeking charge, but has not called for Carrillo's resignation in its editorials. The paper has also reported that it has been unable to gain access to either the 911 calls or the police report from the July 2013 incident, yet there has been no reported story or editorial on the Carrillo case that says the paper has filed a public-records request for that information. The paper's latest editorial on the subject, published Feb. 27, again noted that it had been denied access to the 911 tapes and police report, and said that the information should be released after the Carrillo incident has been adjudicated. "Santa Rosa's interim police chief Hank Schreeder declined this newspaper's latest request for the 911 tapes, citing the ongoing prosecution," the PD wrote. "But given that, there should be no obstacle to releasing these documents, including the police report, after the case is resolved." At that point, Carrillo will have had his day in court and would not be subject to any actionable questions about the criminal charges that were lodged related to the incident. On Feb. 6, Carrillo was appointed to the Sonoma Clean Power Board. Bosco emailed him to congratulate him on the selection. On Feb. 7, Carrillo texted him back, "Doug, thank you for your email and support!" The Bohemian put in a public records request with Chief Schreeder on Feb. 27, seeking access to the 911 tape or transcripts. The city of Santa Rosa delayed its response beyond the 10-day statutory limit set by the California Public Records Act, citing a need, it wrote, for further "consultation with another department or agency that has a substantial interest in the response to this request." On March 12, the Bohemian's request for the 911 tape was denied. Administrative secretary Carrie Behler wrote that the 911 tape or transcript of the tape was exempt under a section of the law that says investigative records can be exempted from public review. At issue is whether an incident that occurred eight months ago is still under "investigation." The Washington, D.C.–based nonprofit Freedom Forum, which advocates on transparency issues through its First Amendment Center, notes in a roundup of state laws relating to public disclosure of 911 calls that, in California, those calls "fall under the California Public Records Act, which makes all records available to the public through request." The Bohemian, in its request for the 911 tape, noted that the law says "any reasonably segregable portion of a record shall be available for inspection by any person requesting the record after deletion of the portions that are exempted by law." Behler said the decision to withhold the contents of the 911 tape from public review was made by her "in consultation with" Rhonda M. McKinnon, technical services division manager with the Santa Rosa Police Department. The Bohemian sent a set of questions via email to Press Democrat editorial director Paul Gullixson concerning Bosco's guarantee of coverage of the Lopez fund—"I can get plenty of publicity through the PD"—and its coverage of the ongoing Carrillo case. In his response, Gullixson did not address the Lopez fund coverage in the newspaper and says the Bohemian was "fishing for something that doesn't exist." "I've had no conversations with Doug Bosco about what happened with Efren Carrillo, and he has made no effort to contact me about our editorials or to exert influence one way or the other," writes Gullixson. Gullixson adds: "Furthermore, I make no apologies for the editorial positions we have taken and the columns I have written about the Carrillo case. I don't think a reasonable person would look at the totality of the coverage and conclude that we have somehow been soft on the supervisor. If anything, we've been taken to task by a number of people in the community, through letters to the editor and in phone calls, for being too hard on the guy and for not letting the matter drop. "But those have been in the minority. Most readers have been supportive of our coverage and the editorial positions we have taken, including our demands for disclosure in the police report, 911 tapes, etc., and our concern that this matter not end with a plea bargain and a blackout of information." The Bohemian asked Gullixson if the PD had ever put in public records request for the 911 tapes or the police report: "I would just say that we have repeatedly stated our desire to access the police report, 911 transcripts, etc., and our belief that there's a prevailing public interest in disclosure of this information." In an email, Carrillo answered "no" and "no" to questions posed to him about whether he had asked for Bosco's assistance to help influence the paper's reporting on his arrest, or whether Bosco had made any assurances to him that he would do so. Bosco did not respond to two phone messages seeking his input for this story.